There’s been a lot of bargain-hunting going on in recent years when the Lidl supermarket group in the UK launches one of its seasonal ‘Wine Tours’. Lots of one-off parcels of wine appear in stores, that stretch the Lidl range into sometimes unknown territory. The first tour was an autumn French wines tour based on the traditional Foire aux Vins that hits French retail shops around September each year. 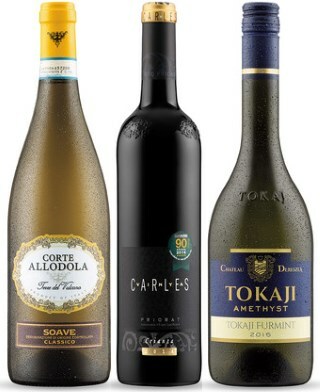 But recently Lidl’s six-per-year events have turned up some real surprises: in this Spring 2018 edition we have Hungarian Dry Furmint, a Crianza from Priorat, and Campanian Fiano, all for under £6. But there are a few wines that creep into the fine wine area too, including Grand Cru Gewurztraminer from Alsace and a 2013 vintage red Graves. Lidl sent me a selection of wines from the promotion to sample. The wines went into stores across the UK on Monday 26th March, and will be available while stocks last. (2018) From Campania in southern Italy, land of Vesuvius and Naples, this is Fiano, a grape that has become synonymous with the DOCG of Avellino, but this from the IGT of Beneventano. A touch of herbs and stone-fruit (apricot, peach) on the nose, but fairly subdued aromatically. In the mouth it is quite full and has some richness, more dry stone- and apple fruitiness, a nice lick of salty mineral acidity and a moderate finish. A nicely flexible food-friendly style given the bit of textural richness and freshness. (2018) LPS stands for Laposa, a wine estate in the Badacsony region of Hungary. This Riesling is reasonably aromatic, flitting between apple and citrus and a touch of floral character. In the mouth it is similarly dry, apple-fresh, and enjoyable but doesn't really have the decisiveness or mineral zing that Riesling lovers look for. (2018) From the Venice area, Soave is one of the great names of Italian white wine, though the quality of what is produced can be variable. This, however, is a very nice example, a blend of 85% Garganega and 15% Trebbiano I guess it must have seen a little lees ageing to add a gentle mealy, mineral quality to cool citrus and orchard fruits, a touch of blossom, but a clean, agile palate with beautifully defined acidity. Another favourite in this crop of wines. (2018) Twenty kilometres west of Strasbourg, the Grand Cru of Steinklotz is at the northern tip of the Alsace wine route, and Gewurztraminer is the main grape planted on its limestone soils. This light golden wine opens with a touch of typical Turkish delight and rose perfume, subtle over stone fruits. In the mouth it is medium-bodied and off-dry, the fruit and sweetness offset by a bitter orange, pithy grip so typical of this variety. It is a fairly straightforward rendition, but match it to some spicy Chinese or Thai food and the balance, sweetness and freshness will work well. (2018) Along with the dry Furmint, one of the stars of the line-up for me - though you have to like a fair thwack of charry, spicy oak in your wines. In this Priorat it is matched by plenty of berry fruit, smoky and mineral in its own way, and a hint of Parma violet to the aroma. It has excellent drinkability, made principally from Grenache with some Bordeaux varieties in the mix, giving a fruit freshness and silky richness to the palate. A grippy bite of tannin and good, clean acidity completes the picture of a wine that's a banker for barbies this summer. (2018) Joven indicates a young wine, with minimum or zero oak ageing. As far as I can see this is 100% Tempranillo from the premium Ribera del Duero appellation, the nose bright and certainly fruit-forward, lightly herbal nuances to crisp blackcurrent fruit. In the mouth it is savoury and certainly fresh with a rustic bite of tannin and plenty of tangy cherry-pit acidity, just some spice into the finish. It could do with a bit more fruit density. (2018) From the organic vineyards of Count Degenfeld, this is 'Szamorodni'. That means it was vinified from bunches containing a good proportion of Botrytis-affected grapes, unlike Tokaji Aszú, which is made only from hand-picked Botrytised grapes. Sweet and clean, with plenty of honey and light tobacco notes, dried apricot and zesty lemon. Lightly silky rather than viscous on the palate, it has a fine delicate but definite sweetness, a touch of chamomile tea, lovely fruit and excellent acidity. It's reminiscent of a later harvest New World Riesling in some ways, but delightful and all set for lighter, fruity desserts or blue cheeses. Good value at the Wine Tour price (for 50cl).